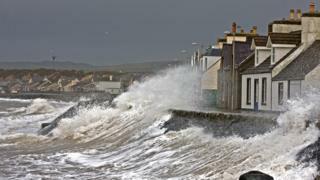 The storm that brought near-record snowfall to the eastern US has caused heavy rain and high winds in much of Scotland. The Met Office issued five yellow "be aware" warnings for Tuesday, Wednesday and Friday. It has forecast southerly gales and also heavy rain for parts of southern, western and northern Scotland. The Scottish Environment Protection Agency has issued over 50 flood warnings where flooding is expected. Deep standing water on the M9 motorway near Stirling closed the southbound carriageway for several hours. Because of flooding at Kirkconnel, the railway line between Kilmarnock and Dumfries was closed. There was further disruption to rail services in Ayrshire because of flooding on the line between Kilwinning and Saltcoats. The East Kilbride line was also closed briefly because of flooding near Busby. The M8 motorway was closed westbound at Hillington in Glasgow after portable cabins were blown off a lorry onto the carriageway shortly after 10:30. And the A1 was closed in both directions at Dunbar in East Lothian after two lorries blew over at about 08:25. In Dumfries, firefighters were asked to carry out a safety inspection of the police station roof, while the Whitesands area was flooded. Pupils at Aberfoyle Primary School in Stirling had to be rescued by boat after the building was cut off by flooding. The B829 Aberfoyle to Kinlochard road was flooded with almost a metre of water after the River Forth burst its banks. Police and members of Trossachs Search and Rescue team are also at the scene. Appliances from Bathgate, Aberfoyle and Balfron fire stations, and water rescue teams from Bathgate and Stirling fire stations, used a boat and rescue sleds. Incident Commander Martyn Brandrick said: "This incident required specialist technical processes to ensure safe systems of work were implemented." The weather picture for later in the week could see high winds and cooler temperatures bringing snow. The BBC weather centre said the wet and windy conditions were related to the "remnants" of Storm Jonas that brought heavy snowfalls to the US. The warm weather has been due to a tropical maritime air mass. Live flood warnings from the Environment Agency and the Scottish Environment Protection Agency. Note: the Scottish Environment Protection Agency display their flood alert data differently to the Environment Agency and Natural Resources Wales. While the Environment Agency and Natural Resources Wales highlights individual rivers only, in Scotland the entire region is coloured to indicate the level of alert. This map and flood alert data are supplied to the BBC by third parties. The BBC is not responsible for its accuracy and you use it at your own risk. Tap here for up-to-date flood information. Tap here for up-to-date travel information.